Well, so far we have not seen any follow through on yesterday’s decline. I’m still not convinced it was a one day thing, so I’ll be watching momentum names that have lead the market over the last few months very closely. Take AAPL. While it’s bounced nicely this morning, we really don’t yet know if this is a “dead cat bounce” or a solid recovery. 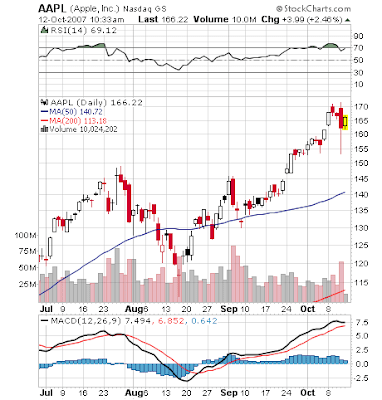 The tell here is if AAPL can break 170.